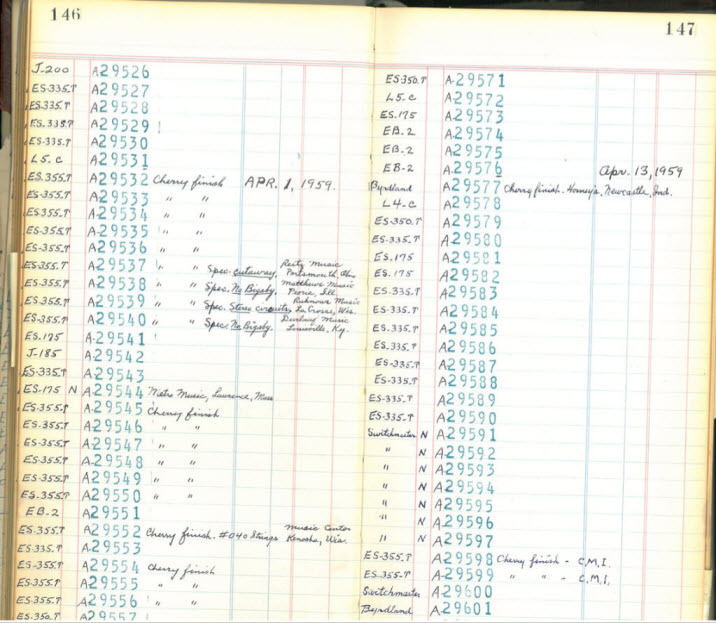 This ledger page from April of 59 shows two special order 355’s-A29538 (which I owned) and A29540 which hasn’t surfaced as far as I know. The ES-355 is an interesting bit of old school marketing. Unlike the auto industry, the guitar business didn’t offer a lot of options to jack up the sticker price. In Gibson’s case, they offered a range of models which added features and jacked up the price. The ES line had a lot of models but the 335, 345 and 355 were really a line of their own. They were, essentially, the same guitar with high priced, mostly cosmetic upgrades. And the price increase was heart stopping. The sticker price of a 59 ES-335 was $335 including a hard case. 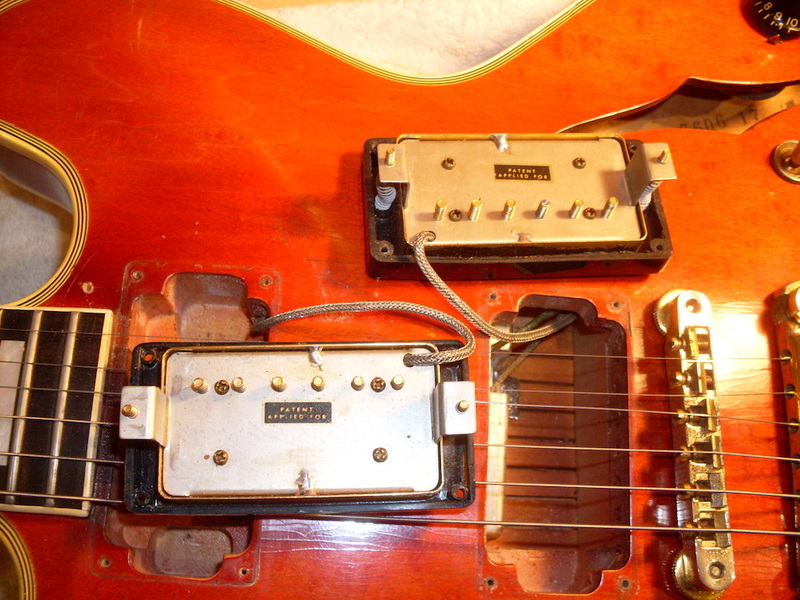 An ES-345 was $415 and added gold hardware, stereo/Varitone circuitry and some fancier appointments like parallelogram inlays and multiply binding on the front. That’s not just an $80 increase which seems insignificant. That’s a 25% increase. But wait. There’s more. The ES-355 added a Bigsby as standard, a fancy inlaid headstock, ebony fingerboard, real mother of pearl block inlays, Grover tuners. It was available in mono or stereo. The stereo version was a whopping $645. That’s a 95% increase over a 335. Talk about sticker shock. Want a stop tail 355? Well, you’ll have to wait because it isn’t an option. It’s a special order. This is the stereo 355 stop tail I just got. Nice watermelon fade and some pretty unusual features. Read on. 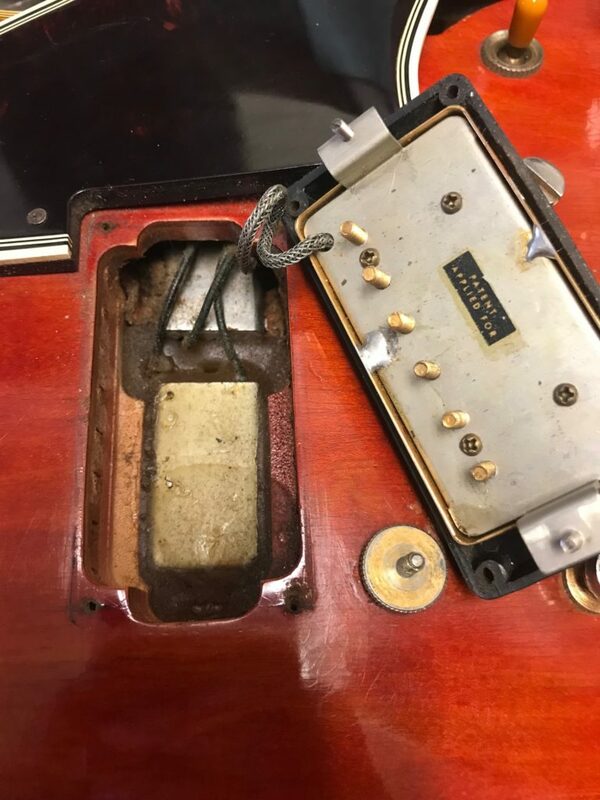 So, I just bought an early 59 stereo ES-355 stop tail. 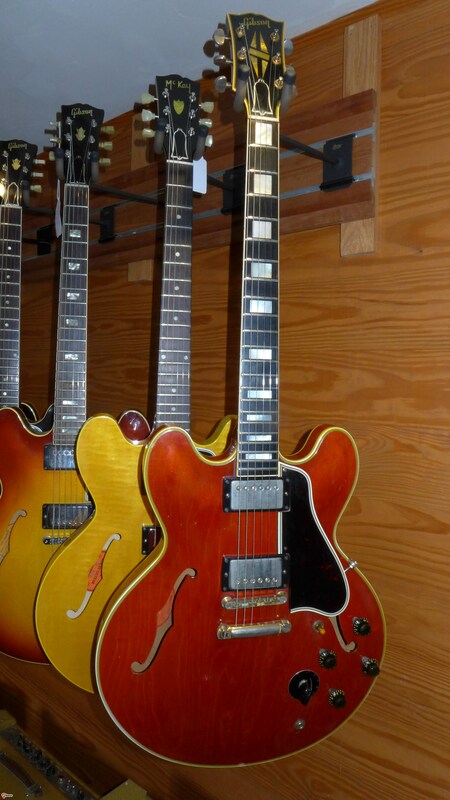 The ES-355 is a pretty rare guitar to begin with given the price (and the relative value). In 1959, Gibson sold 592 335’s, 478 ES-345’s and just 300 ES-355’s. No surprises there. But how many of those 355’s were ordered with a stop tail? It’s hard to know for sure but I know of four from 59, four from 60 and one from 63. I’m sure there are others but I think around a dozen known is probably accurate. Of the 6 that I’ve owned, only two have had the big 59 neck including the one I now have. Four have been mono. But this one is different than all the others. Those of you who read this page know about the desirable “first rack” 345’s. It always seemed odd to me that these very early 345’s unique features (short leg PAF, shallow rout for the choke and sometimes wax potting) never showed up in the early stereo 355’s. I’ve had at least 7 or 8 early stereo 355’s and all had the fully cut center block. Most of the monos had it as well although some had the solid center block. I believe that the first stereo ES’s were 345’s the earliest pre-date the first racks and may have been prototypes but there are 3 or 4 of those. They date from February and have 58 FONs so it would make sense that the earliest 355’s would have the same features. This stop tail is the very first one I’ve seen like this. The FON of the first 345’s from February is T7303. The earliest of the “first rack” 345’s is S8537-months later. The FON of the earliest 355 stereo in my database is S7624 which is one of the earliest in 1959. I just went through my archives and found another 355 with a short leg PAF but not the shallow rout. That was from the next rack S7625. The others (5 of them) from S7624 that I’ve had were all monos. So this might be the only rack with 355’s with these features. I think I can assume there are others like this, a rack is 35 guitars and I only have 6 from this rack and this is the only stereo and one of two stop tails in the rack. I can assume there are more stereos like this but probably not another stop tail stereo. That likely makes this one a unique example. Geeky stuff for sure. Geeky is what I do. So why spend a whole bunch of extra money for a stop tail 355 when you can buy a stop tail 59 345 for much less? Because red stop tail 59 345’s are just as rare. You can get a red 60 345 for reasonable money but the neck will be slim. How about a red 335 from 59? Red stop tail 59 335’s are crazy rare-I think there are three. Red stop tail 59 345’s are stupid rare (3 or 4) and red stop tail 355’s are rare and then some (4). It’s a pretty exclusive club-only 11 members, although I know one collector with at least one of each. Maybe sunburst doesn’t look so bad after all. This is the usual stereo bridge pickup rout. The choke is in the space between the pickups not under the bridge pickup like it is in a first rack. Note the size of the rout. Like a first rack 345, this 355 has the choke right under the pickup which requires the short leg PAF for clearance on the right side. This one is wax potted which is a feature of some, but not all, first racks. Good heavens, Charles. I may have to buy some Powerball tickets. Charlie, wonderful details…love 355 models! As another geeky comment note the factory seems to have “clipped off” the treble side height adjustment screw as opposed to sawing it off. This observation based on the visible remaining “line” of material running across the surface of the modified screw end. Some powerful snips! All hail Charlie Gelber, King of ES-3XX Land! Thanks again for bringing so much knowledge and so many wonderful guitars to light. As I’ve said before, one very much hopes a book is forthcoming. Even a compilation of posts and pics would be fantastic. Cheers.